The Tiburon Intl. Film Festival closes today (although, according to their schedule, their last screening was yesterday). The big one (or at least one of the two big ones), the San Francisco International Film Festival, opens Thursday. B+ The Lost Boys, New Parkway, Thursday, 9:15. This clever and funny–and even occasionally scary–teenage vampire movie was shot in Santa Cruz and is clearly set there (even though they give the town another name). 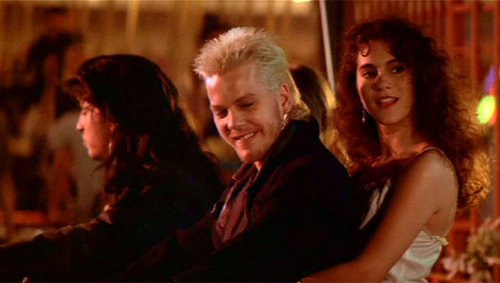 So you’ve got the undead dealing with summer on the beach, the boardwalk, and teenage angst. But then, what do you do when peer pressure tells you to become an immortal bloodsucker? Hey, all the cool kids are doing it. A lot of fun in a horror movie that refuses to take itself seriously. C+ Yankee Doodle Dandy, Alameda, Tuesday and Wednesday. This Warner Brothers biopic about singer/dancer/songwriter George M. Cohan doesn’t have much of a story. 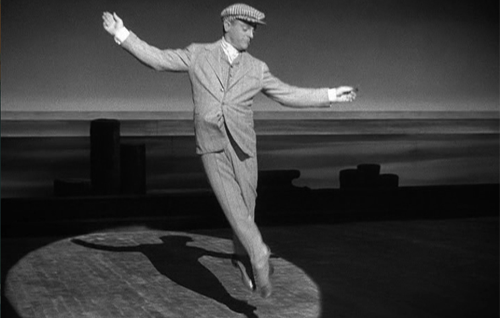 It has some exciting dancing sequences that show off a side of James Cagney’s talent that we usually don’t see. But when Cagney isn’t dancing, it’s just not that interesting. As the title suggests, the picture has a lot of patriotic hoopla–which is understandable for a movie made as we were entering World War II. B+ Johnny Guitar, Castro, Wednesday. A very unusual western from Nicholas Ray. For one thing, the main rivalry is between two women: good saloon owner Joan Crawford and bad businesswoman Mercedes McCambridge. But don’t think this is a feminist picture. The women’s hatred stems from romantic jealousy, and the title character hero (Sterling Hayden) is a former lover of Crawford hired as her bodyguard. It’s fun, and strange, with lesbian overtones, but far from a must for western lovers. 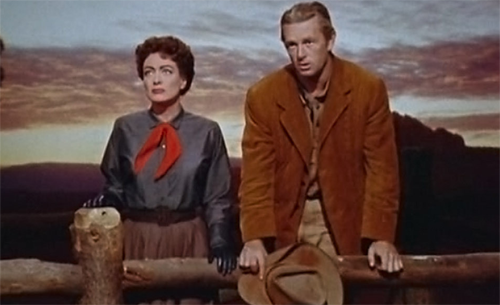 On a double bill with Fritz Lang’s Rancho Notorious–which, I have to admit–I’ve never seen. B+ The Ten Commandments, various CineMark theaters, Friday & Sunday, 2:00; Wednesday, 2:00 & 7:00. I enjoy a strange relationship with the biggest commercial hit of the 1950s. With its simplistic characters, corny dialog, and overriding atmosphere of pomposity, The Ten Commandments is the ultimate unintentional comedy. And yet, it’s also a rich, generous, and entertaining spectacle, and a visually lovely motion picture. It has one truly impressive, low-key performance (Cedric Hardwicke as Sethi). At times, it even succeeds in its simplistic spirituality. Read my Blu-ray review. I should note that the Friday screening is on Good Friday, the Sunday screening on Easter, and both are during Passover. C- Harry Potter & the Sorcerer’s Stone, Roxie, Sunday, 4:20. Although entertaining, the first Harry Potter novel showed little of the power, complexity, character, wit, and entertainment value of the sequels. The first Harry Potter movie, trying desperately to be as faithful to the book as possible, showed even less. However, this particular screening may be more entertaining than the original. According to the Roxie’s website, "A spell was cast onto the soundtrack, and now it’s something magically different for this screening." I have no idea what that spell is. A- The Princess Bride, New Parkway, opens Saturday. William Goldman’s enchanting and funny fairy tale dances magically along that thin line between parody and the real thing. The then-young and gorgeous Cary Elwes and Robin Wright make a wonderful set of star-crossed lovers, and Mandy Patinkin has a lot of fun as a revenge-filled swashbuckler. There’s no funnier swordfight anywhere, and who can forget cinema’s greatest acronym, ROUS (rodents of unusual size). On the other hand, some of the big-name cameos really grate on your nerves. 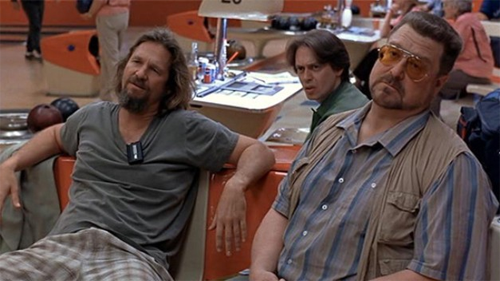 B The Big Lebowski, Clay, Friday through Sunday, midnight. Critics originally panned this Coen Brothers gem as a disappointing follow-up to their previous endeavor, Fargo. Well, it isn’t as good as Fargo, but it’s still one hell of a funny movie. It’s also built quite a cult following; The Big Lebowski has probably played more Bay Area one-night stands in the years I’ve maintained this site than than any other three movies put together.